Got past an editor of a newspaper or newsroom. At any point, if the “science” isn’t controversial, interesting, or just plain weird, it drops out of the loop and sits quietly in the ivory tower of academia. This leads back to the post title, if you hear about some “science” in the news, at a minimum, the findings are being exaggerated and hyped or are just plain wrong. But, the science you don’t hear about continuously makes steady progress and verifies and improves on previous research. As an analogy, imagine a research paper that claims smoking two packs of cigarettes a day will give you perfect health, let you live to 150, and give you a full head of hair. That article will make the headlines of every newspaper, TV program, and aggregating website imaginable. But, the real science is in the decades of research and innumerable papers proving the dangers of smoking. Carnival Barker Game: Guess the sturgeons age! This weekend, CBC reported that father-son vacationers, Paul and Don Jarvis, caught a 3.5 meter (~12 ft) sturgeon weighing an estimated 400 kg (just under 900 lbs). Since the story made it to US national news, it doesn’t really fit my Meanwhile in Canada series, but I went down the internet rabbit hole to make it an Interesting Science subject. The most accurate way to age a sturgeon requires that it be killed to count the layers (similar to tree rings) of the dorsal fin just behind the head or from the otoliths (literally, ear stone). To simplify matters, several organizations have made length charts to correlate the fish size to age. For example, see these from Minnesota (pdf) and Fraser River, BC (where this fish was caught, pdf). Neither of these give the age for the size of sturgeon caught, so they are only useful as general info. Plus, river sturgeon grow larger than lake sturgeon, so comparisons for different regions are troublesome. Furthermore, a 2003 study from Idaho Fish and Game (pdf) summarized 23 years of research to correlate known fish growth over time to the fin ray method. They determined that the fin-ray method actually under estimated a sturgeons age. Newer information, like those from Wisconsin have applied a correction factor to improve the accuracy. So, back to the question, how old is that sturgeon in the river? Nobody knows. The fish did not have a transponder tag to give any background information (although one was inserted in case it is ever caught again). General guesses range between the founding of the Dominion of Canada (1867) to the Yukon Gold Rush (late 1890s). Makes you feel young. Where’s the pronghorn antelope fawn? Can you spot the pronghorn antelope fawn in the picture? I put the reveal photo below the fold, if you can’t find it. Newborn fawns can walk within an hour of birth and can briefly outrun a coyote in three days. But, they are susceptible to predation for several months. 40% to 80% of fawns will not survive this dangerous time. Until they are better at running, the fawns are very good at laying flat to the ground (especially with their big ears) and not moving a muscle or making a sound. The fawns can be extremely difficult to spot and someone can step right over them without noticing. The original NPR article (“Parents With Noisy Babies Shouldn’t Read This. They’ll Be Too Jealous”) highlights the fawns quietness. That hardly seems surprising, as any prey animal would have to adopt this behavior. Which is why I’ll never have a job writing viral news headlines. What I found more interesting was a 1983 research paper discussing whether the pronghorn mother might reveal information about the location of the fawns*. She does feed them every 3 or 4 hours, but keeps her distance the rest of the time to not draw attention to their hiding place. Obviously, predators would love to have an easy meal, so they watch her very closely. The researchers found the mother would quickly move an average of 70 m (230 ft) away after feeding. They calculated that a coyote would expend more energy than could be obtained from hunting common squirrels if they simply started at the mother’s initial location and began a random 360° search. Basically, that distance makes fawn-hunting a net loser for a coyote and it eventually will get hungry and go chase squirrels. Similarly, the mother stays away for a long enough period that the expected benefit for watching and waiting is below squirrel chasing. However, the researchers did notice that the mothers have a slight tell – they will orient their head and body toward the fawns more often than away and will steal frequent glances at the hiding spot. The coyotes do not seem to have picked up on that bias, however. * Bonus factoid: Pronghorn antelopes always have twins. Here’s one I’ve been dying to post. 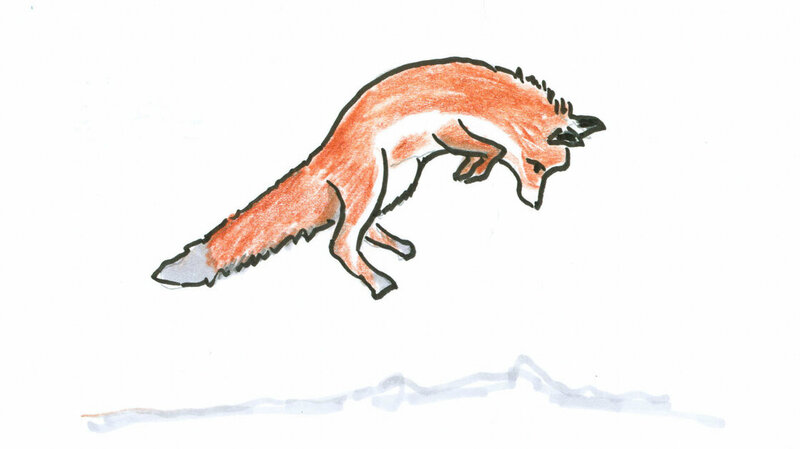 How does a fox catch mice when they’re hiding under the snow? Foxes have sharp hearing, so they obviously listen for the little tunnelers. Pouncing in a random direction, though, is only successful about one out of five tries (18%). But, pouncing in a northerly direction is effective three out of four times (73%)! While the mechanism is yet to be worked out, the researchers think there must be some magnetism involved. Pretty cool. The NPR link above has a general description, plus the cool drawings. Ed Yong originally covered this in 2011 and has the more technical description. Tara Garnett at PLOS One’s Community Blog was discussing a new article about Fox Squirrel behavior on campus. In short, they evaluated the squirrels running around on campus as to whether they would eat or hoard nuts. That sounds like a quite the decent research project. I imagine the squirrels were pretty happy about it, too. Earlier today, I mentioned Jeff Master’s WunderBlog guest post from Dr. Michael Ventrice with a detailed explanation on the signs indicating a significant El Niño event for late 2014. What I found interesting was the pulse of westerly winds that can lead to the El Niño. The trade winds near the equator typically blow from the east to the west (due to earth’s rotation). This pushes warm surface water where it pools near Indonesia and Australia. Cool deep water then upwells near Chile providing good fishing grounds. To counteract the easterlies, a westerly burst of winds weakens the trade winds. The warm surface waters then stay near Chile and the cool water stays in the ocean’s depths, i.e., an El Niño. What can cause that westerly pulse? Basically, a pair of cyclones. North of the equator cyclones (or hurricanes in the Atlantic Ocean) rotate counter-clockwise; south of the equator, clockwise. If you have a near simultaneous occurrence of two cyclones bracketing the equator, the rotation will squeeze a burst of wind from west to east. It reminds me of the antique washing machine wringers used to dry clothes.